STICK obtained generous funding from the Museums Galleries Scotland Skills Development Fund to deliver a three day industrial object conservation training course. This was hosted by National Mining Museum Scotland in early April 2017. 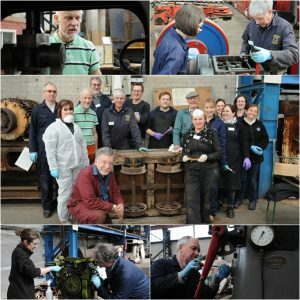 The course was aimed at non-specialist museum staff and volunteers who have been tasked with caring for industrial collections with complex needs, and who do not have routine access to conservators and conservation resources. The aim was to upskill and give confidence to these individuals to enable them to better care for their collections and have confidence in managing and documenting preventative conservation projects in their organisations. Twelve participants from organisations across Scotland took part in the course, which was delivered by Jim Mitchell of Industrial Heritage Consulting Ltd.. Some of the time was in the classroom discussing what conservation means, ethics, hazards, safety and techniques, among other topics. However, the majority of the course was spent in National Mining Museum Scotland’s large object store where the group got hands on with seven different items from the collection, applying learning directly, receiving direction from Jim and documenting their work on paper and through photographs and films. More information and resources can be found on the project website here.